I just got back from three days in the mountains at our cabin, and two more days on the snow. It has not snowed for a couple of weeks, and it was a good thing that the weather was warm because it made the slope a nice combination of warm soft snow and good hard packed. I even tried snowboarding again for the first time in 8-10 years (can't remember exactly when the last time was). But I did pretty good and had a good time hitting the slopes on one plank with K80. 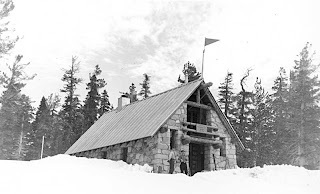 So tomorrow is the big day, the drive up to Yosemite followed by the annual pilgrimage to the Ostrander Ski hut. I am not sure this year I am as prepared as I have been in the past, but ready or not here I come. This will be the 6th year the same group of friends have made it to the hut and it feels good to have an annual tradition that just can't be broken, no matter how loud or obnoxious George is, how hung over (aka "sick") Craig gets, how lost Dan gets or how grumpy I am. Every year has been full of anctics and this year sounds like it is shaping up to be another great one. Maybe we will actually do that slide show we have promised in the past. Hoping to get out of town early, but no promise it will actually happen. Well lets just say it is my own damn fault. Anyways we head out Thursday night, and this week is going to be full of packing and figuring out just how heavy I am willing to allow my pack to become. It looks like they just got another dump, but also that it is going to be warm this week, which is prime weather for crust and ice. Still can't wait to get out on the trail and test the legs.